Simple, competitive, addictive play! Each player has 8 buttons on their side. When the game starts, 4 buttons become illuminated on each player's side. 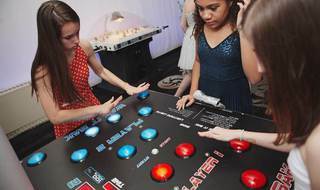 Each player then hits each illuminated button and when he/she does that, the illuminated button goes to the other player's side. The hottest new rhythm game, DJ Hero, in our stunning deluxe setup! 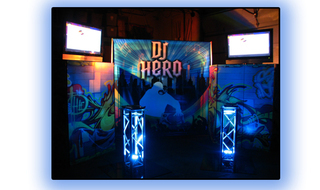 Complete with plasma screens, LED-lit trussing, and custom graphics, our DJ Hero setup takes the game a few levels higher. An incredibly eye-catching attraction and a fun, interactive experience to boot! Jump right into the play area and start slicing up some fresh cuts with your fellow guests! Check it out! Our sleek, elegant upright trussing supports up to two monitors, back-to-back. 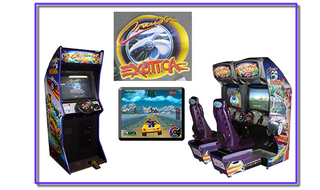 Each monitor features one gaming system - Playstation 3, XBOX360, or Wii. 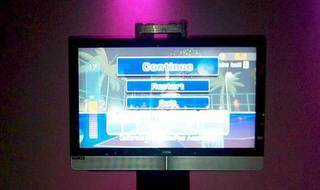 Boogie down with the wildly popular Dance Dance Revolution! 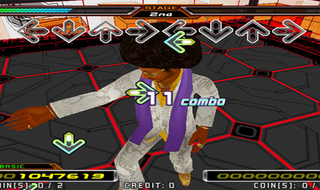 Bust a move on your own or cut a little rug with a friend in 2 player mode! 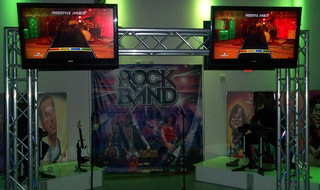 Your guests will be thrilled at our custom-built, high-tech setup of the wildly popular Rock Band! Pick up the axe and wail away on the guitar or bass, get busy on the drum kit, and sing your heart out to these rock classics! Team up as a police duo to shoot down terrorists in this fast-paced interactive target game! 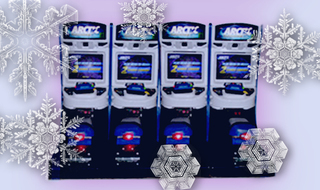 Hoist yourself onto our specialized snowmobile seat, grab hold of the throttle, and race through the snow! Race against the clock or up to 3 other players for the fastest time to the goal line! 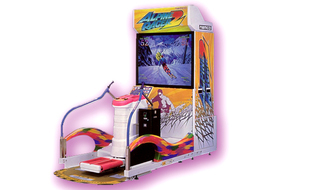 Step onto our swiveling platform where you will rotate your body to control the on-screen skier. Stay between the flags to build momentum and go for the fastest time at the goal line. 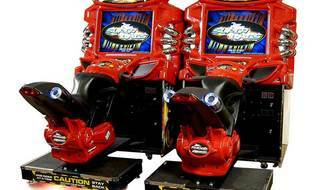 Also available in competitive 2 player configuration. Cool! Sit down into the driver's seat, grab hold of the wheel, and floor it! Race against the computer in a contest to the finish line. Multiple tracks available from mountains to snowy terrain to city streets. Available in solo or multi-player configuration. 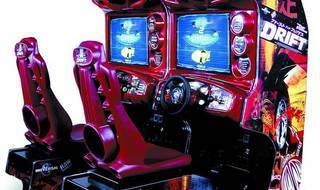 Fast & Furious Tokyo Drift offers players 12 courses to choose from. Drift around turns and use your momentum to beat your opponents to the finish line! Available in single or multi-player configurations. Straddle up, grab the throttle, then BLAST OFF at ROCKET SPEEDS on the Fast & Furious Superbike! Available in single or multiplayer configurations. 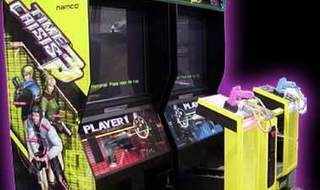 Choose from either of these arcade favorites in one convenient cabinet. 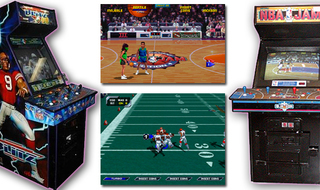 NBA Jam pits players against each other in an exaggerated game where flipping dunks can set the net ablaze while NFL Blitz lets players get a little rougher than usual over the pigskin. Humorous and great fun! 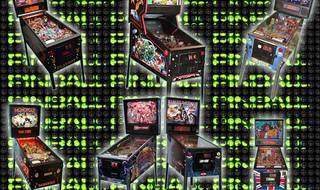 Prepare your reflexes and perform as many skill shots as you can in one of our many themed pinball machines! Themes such as sports, movies, popular television, and pop culture icons are just a few examples of the games we can provide for your next big event. Check out this rad custom-designed Tony Hawk's Pro Skateboard setup! You control the skater on-screen as you shift your momentum on the intelligent skateboard. Catch some big air!